The Palestinian school built with Belgian funding is still named after terrorist mass murderer, Dalal Mughrabi, who led the 1978 bus hijacking and murder of 37 Israelis including 12 children. On Sept. 27, 2017, Palestinian Media Watch released a report documenting 31 Palestinian Authority schools named after terrorists, one of which PMW is certain was built by the Belgium government. PMW has now discovered that the PA has defied Belgium, and the school continues to be named Martyr Dalal Mughrabi Elementary School. 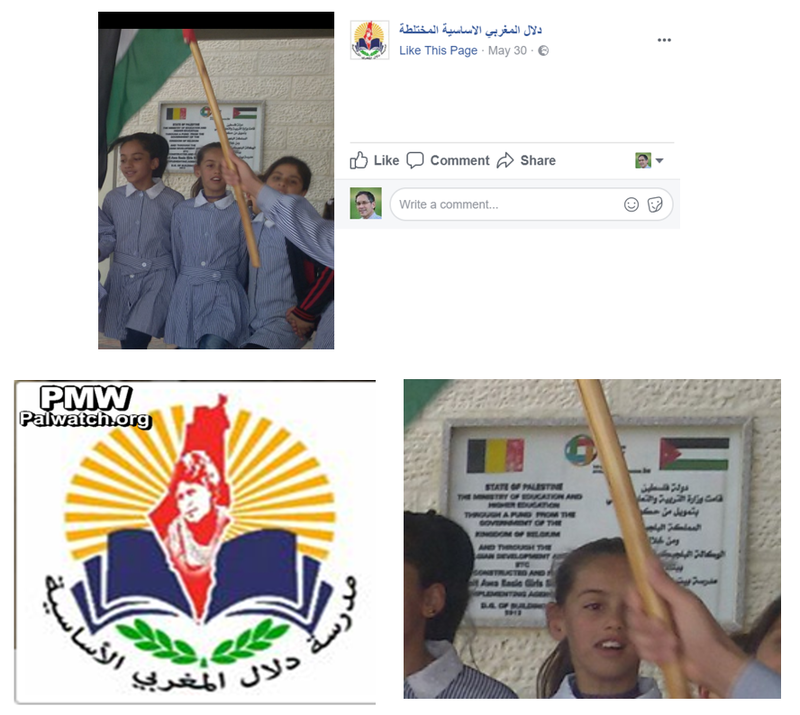 PMW has confirmed this after the official PA daily published a story announcing the "launch of activities of the outstanding athletic clubs," hosted by none other than the Dalal Mughrabi School in Southern Hebron. PMW examined the pictures from the event and noted that the same plaque thanking Belgium for funding the school named after the terrorist mass murderer can be seen in the pictures from the recent event. After PMW's original report, Belgian authorities not only condemned the renaming of the school after a terrorist but also announced a freeze on all funding for PA school construction pending a formal response from the PA.
"Belgium unequivocally condemns the glorification of terrorist attacks [and] will not allow itself to be associated with the names of terrorists in any way. Belgium has immediately raised this issue with the Palestinian Authority and is awaiting a formal response... 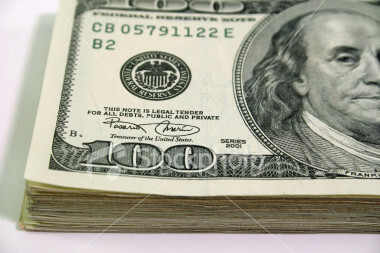 In the meantime Belgium will put on hold any projects related to the construction or equipment of Palestinian schools." "Belgium is a long-time partner of the Palestinian Authority's strategic plan for education. Belgium endeavours to promote a culture of respect for human rights, human dignity and tolerance. These principles should be reflected in curricula taught at schools funded abroad by Belgian taxpayer's contributions as well as in the names and logos of such schools." Another setback in Belgium's stand against PA terror came 8 days later. 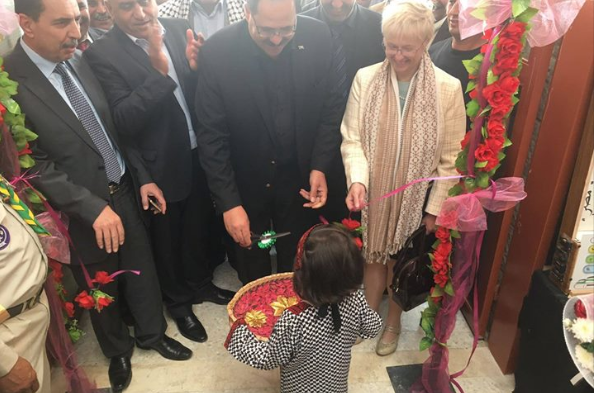 Ignoring its unequivocal condemnation of the PA Ministry of Education's glorification of terror, a Belgian official - Eric De Muynck, representative of the Belgian Development Cooperation Institution - participated with the PA Ministry of Education - in the inauguration of a new Palestinian Authority school. In response to De Muynck's participation in the event, in November 2017 The Algemeiner reported that while Belgian authorities had held several meetings with Palestinian counterparts on the renaming of the school in Beit Awwa, spokesperson Vanderhasselt claimed that "the dialogue has not been concluded and is being pursued." 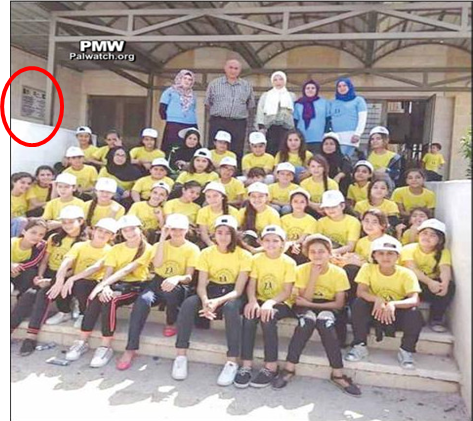 Nearly a year has passed since PMW exposed that the PA named the Belgian-funded school after Dalal Mughrabi. According to its own statements, Belgium "unequivocally condemns the glorification of terrorist attacks" and demands that "[t]hese principles should be reflected in curricula taught at schools funded abroad by Belgian taxpayers' contributions as well as in the names and logos of such schools". Yet, based on the new information PMW is exposing today, it is clear that the PA is defying Belgium in spite of these "dialogues." The school that was built with Belgium money, still today, has on its walls the name of a terrorist mass murderer together with the flag and dedication of the Belgium government. Not only is Belgium ignoring this snub, Belgian officials are participating in the inauguration of Palestinian schools, including those once again funded by Belgium. PMW calls on the Belgian government to unequivocally condemn the PA Ministry of Education for presenting terrorists as heroes and role models for Palestinian children. Moreover, Belgium should follow through on its original demand that the name of the Belgian funded PA school be changed, and that any additional support to the PA Ministry of Education will be conditioned on a new name for the Belgian-funded Dalal Mughrabi school.